Oil drilling efforts are getting closer to the Alaska’s Arctic National Wildlife Refuge (ANWR). Last month, the Bureau of Ocean Energy Management issued a conditional permit for the Liberty Project, a proposal by a subsidiary of Houston-based Hilcorp. The company plans to develop production wells on an artificial island in the Beaufort Sea, about twenty miles east of Prudhoe Bay, North America’s largest oil field, and only five miles off the Alaskan coast, near ANWR. In my memoir, Refraction, I wrote about Mukluk Island, a similar gravel island as the proposed Liberty Project. 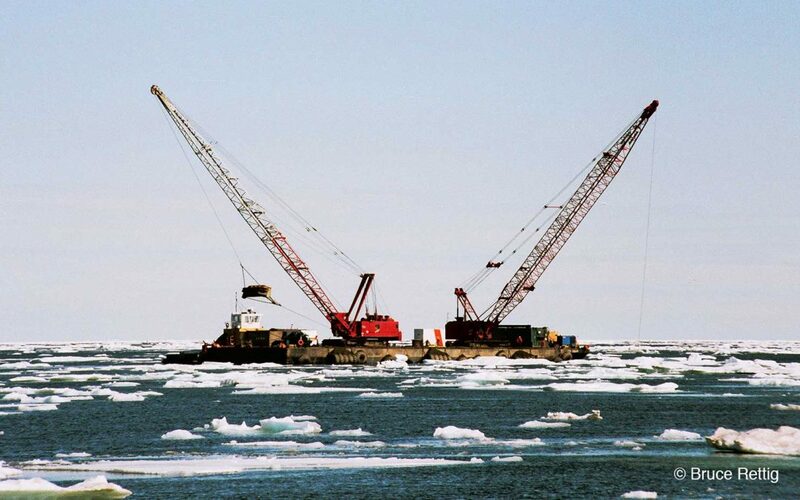 Mukluk was completed in 1982 in the Beaufort Sea and cost more than one billion dollars to build. It also gained notoriety as the most expensive dry hole in oil industry history. I’ll write more about Mukluk Island—where I served as a deckhand on a tugboat and gravel-hauling barge to the island—in a later post. Note: the photo in this post was taken during the Mukluk project, and shows our boats and barges positioning equipment for island construction. The basic design concept for an artificial offshore gravel island is simple. The goal is to use materials with enough height and bulk to protect the island against ice and water damage over the life of a drilling project. For winter island-building, ice roads are built and maintained over a frozen sea. Large water tankers spray water on the roads to increase thickness and durability. These surfaces provide a smooth, flat driving route void of obstacles for the vehicles. Upon arriving at their destination, the trucks deposit gravel through a hole cut into the ice and it sinks to the seabed. It eventually piles high enough to break the water surface; an island is born. As is most often the case, there are varying views regarding the Liberty Project. For Alaska, it would produce jobs and increase economic vitality. Bob Stinson, an employee of Price Gregory, a company that constructs oil pipelines, stated “The Liberty Project represents a positive step towards perpetuation of the oil and gas industry in Alaska by curtailing oil production decline at this crucial time in Alaska’s history.” At the opposite end of the debate, Kristen Monsell, ocean legal director for the Center for Biological Diversity, said approval of Liberty sets the country down a path of destroying the Arctic. “An oil spill in the Arctic would be impossible to clean up and the region is already stressed by climate change,” she said. According to Business Insider, roughly 10-15% of an oil spill gets cleaned up. Oil from Alaska’s Exxon Valdez spill in 1989 still sits on the beaches of the Prince William Sound, and orca populations in that area haven’t returned to their pre-spill numbers, according to the USGS. The Liberty Project would greatly increase oil flow through Alaska’s Trans-Alaska pipeline. The pipeline is now running at about 500,000 barrels per day. Hilcorp plans to produce up to 70,000 barrels per day from Liberty. But even more important, it would position oil drilling one step closer to ANRW, one of the most pristine and unspoiled areas in the world. In geologic time, small natural islands such as the ones in the Arctic, remain in constant flux. The sea and ice, relentless forces powered by winds and winter storms, carve new shorelines and shape the contours of the land. In the case of a man-made island, the gravel-bag armor system eventually breaks apart. After years of harsh weather, when the drill rigs and support equipment are long gone, the sea will reclaim control over another small land mass. Everything is in a fluid state of transformation in the arctic. Nothing is permanent. Enter your email address to subscribe to this blog and receive notifications of new posts by email (approximately once a week). All content copyright ©2019 Bruce Rettig. All rights reserved.